Safe Kids is dedicated to providing you with a comprehensive list of monthly child-related recalls collected from the major federal agencies: the Consumer Product Safety Commission, the Food and Drug Administration and the National Highway Traffic Safety Administration. 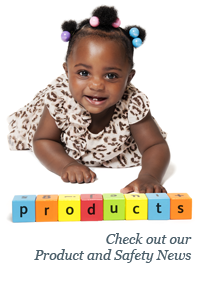 We also bring you any news and consumer concerns about children's products. Remember that safety recalls don’t expire, so check our product recalls pages regularly, especially if you receive hand-me-downs or buy children’s products at a secondhand shop or yard sale.